I want to spend the next little while attending to some of our edges as a society, and exploring how we might inhabit them as Christians. As the echoes of the singing resonated around the wasteland, the words of the song resonated with the stories of my neighbours. Experiences of abandonment, of being overlooked, and forgotten, and done-to and let down. But also of a defiant hope that would not die, and instead insistently claimed it would rise, and rise, and rise again. We are living in times of profound fragmentation. In the United Kingdom, the referendum on withdrawing from the EU divided the country between ‘Leave’ and ‘Remain’ (with a wafer-thin majority to the former), but it also exposed divisions between people from different generations, different ethnic backgrounds, and different socio-economic classes. Politicians’ claims that ‘the people have spoken’ immediately begged the question, ‘which people are you listening to?’ While Leave voters were, overall, more likely to come from poorer than more affluent backgrounds, the so-called ‘squeezed middle’ might well have been more decisive for Leave than the ‘left out’ (Rosenbaum 2017; Antonucci et al 2017), and even clearer was the evidence that the Leave vote was overwhelmingly older, and more white, than the vote for Remain. Waking on the morning after, I remember feeling shocked, but also unsurprised. Hodge Hill, our ward, was split just like the country – 52% Leave, 48% Remain. Many of my neighbours (especially my Muslim neighbours) were feeling more unsafe, less at home that morning; and yet many of my neighbours were also feeling happy & hopeful, especially white working-class folk locally, who felt their voice had been heard, for a change. Further afield, and in the days and weeks after, we saw across the country more overt racism and attacks, and at the same time cosmopolitan middle-class people with accents like mine blaming ‘white working-class’ people, for voting Leave, for their anti-immigration attitudes, for their racism. And underneath all of this, there were deeper issues emerging. An identity issue – what the postcolonial scholar Paul Gilroy calls a ‘post-imperial melancholia’, summed up in the football chant “2 world wars and one world cup, doo dah” (and yes, it is still only one!). Gilroy describes it as an ‘inability to face, never mind actually mourn’ the ‘profound change … that followed the end of the Empire’, the ‘loss of imperial prestige’, and ‘the shock and anxiety that followed from a loss of any sense that the national collective was bound by a coherent and distinctive culture’ (Gilroy 2004:98). Lurking under this melancholia, Gilroy goes on to argue, is a further inability to ‘work through’ the feelings of ‘discomfort, shame, and perplexity’ at the horrors of that imperial history itself, and its white supremacist ideology (Gilroy 2004:98, 102; cf also Reddie 2017). But this was as much (if not more) a middle- and upper-class issue as a working-class issue. There were middle-class people blaming ‘white working class’ people for Brexit, or for racism, but that conveniently diverted us from the middle- and upper-class racism behind the Brexit campaign, and entrenched, and widening, class divides themselves – structural inequalities – effects not just of current austerity policies, but also the longer-term legacy of ‘Thatcherism, deindustrialization [and] the rise of the super-rich’. And especially in areas like mine, the lack or loss of employment (or insecure, zero-hours contracts); poor quality, overcrowded and inadequately available housing; unyielding and punitive welfare regimes; and variable and uncertain access to food & healthcare; coupled with a lack or loss of voice in politics – all made a perfect storm. And we might use the word precarity to describe it: a condition of uncertainty, insecurity that affects our whole livelihood. 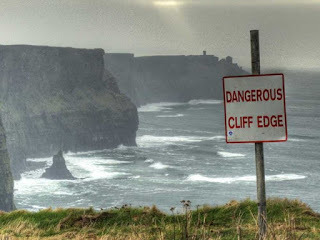 Feeling like you’re on a cliff edge, that at any time you could fall off. And the truth is that in our society that precarity is unequally distributed. Many people have to deal with a hell of a lot more precarity than others. In my bit of the West Midlands, Jaguar LandRover have warned that if Brexit goes ahead, they could pull out of the UK. Thousands and thousands of jobs, directly and indirectly, will be affected. And then, in the early hours of 14th June 2017, a 24-storey tower block in west London caught fire. The fire spread with terrifying speed and ferocity, and despite a massive fire-fighting operation, 71 people lost their lives. The victims came from many different nationalities, many different backgrounds, but they were almost all poor. The helpers came almost immediately: Muslims coming back from prayers after breaking the fast in the middle of the night; and not long after, Christians at local churches throwing open the doors, offering hospitality, food and water, spaces to lament and to pray… and in the days and weeks after, brokering gatherings with politicians, and beginning to call for justice. In the days that followed the Grenfell Tower tragedy, we discovered that residents of the Tower, members of the Grenfell Action Group, had been issuing repeated warnings for several years before, that ‘only a catastrophic event will expose the ineptitude and incompetence of our landlord . . . and bring an end to the dangerous living conditions and neglect of health and safety legislation that they inflict upon their tenants’ (Grenfell Action Group 2016). For Snow, from a profession of communicators, the Grenfell tragedy has brought the issue of disconnection into sharp focus. Rather than seeing their role as simply ‘communicating to’ the wider population, journalists – as part of what Snow calls the ‘narrow elite’ – should be bridging divides of class and background to get to know their audience – not as two-dimensional stereotypes, as victims or villains, but in all their three-dimensional complexity as fellow human beings. ‘So casually written off as nameless migrants, scroungers, and the rest,’ Snow remarks, ‘actually, and it should be no shock to us, the Tower was full of talent’ (Snow 2017). So my question for us is this: how might he and fellow journalists – how might all of us here in this room? How might the Church as the body of Christ stretching from North Kensington to Swanwick and far beyond? – have come to truly see the talent of the Tower’s residents, how might we have thoroughly heard their voices, in those years before the devastating fire – the years of what we might call ‘ordinary time’ – before Grenfell Tower became tragic headline news? This question hits the ground for me in the Firs & Bromford estate where I live and work. That Passion Play, that story of abandonment – and yet in a place that some of us were just beginning to discover a few years ago was ‘full of talent’. In the left of the picture, the Roman centurion, is a man called Phil. Phil was a few years ago one of our ‘unsung heroes’ in Hodge Hill. We found him because some of his neighbours had nominated him as someone who had made a contribution to our neighbourhood. And when we gathered together our unsung heroes, we asked them, “if you could find a couple of people to join you, what would you start in your neighbourhood, what would you give a go?”. And Phil said “I want to start a theatre group”. The Bromford Theatre Group – it did its first Christmas panto a few months before the first Community Passion Play, that Phil sat down and dictated to me in my front room. A different story of our estate was beginning to be told. Why does this matter? The Church Urban Fund has developed something it calls the ‘web of poverty’. It talks about not just poverty of resources, but also poverty of relationships, and poverty of identity – the kind of stories that are told about us, the kind of stories we absorb and believe and live out for ourselves, because others have said this is how we are. It’s the kind of poverty that brings us to a different kind of edge. Less a cliff-edge, and more the edge of what counts as “normal”, what counts as “mainstream”. Pushed to the edge, we experience blame, demonization, marginalization and even expulsion. And its within a wider Wester society that the philosopher of language Gemma Corradi Fiumara calls our ‘non-listening culture’: “the logos we inhabit is ‘halved’ … we know how to speak but have forgotten how to listen’. Our ‘non-listening culture … divides itself into separate discourses, which are free from the desire or obligation to listen to others’, and where ‘powerful’ discourses ‘seek to expand [their] territory through the silencing of others’ (and defining what counts as ‘truth’). And in such a culture, a common temptation is to what Fiumara names ‘benumbment’: the ‘refusal to listen or be listened to, as a means of defending one’s own discursive space against the predatory invasion of other discourses’. In that context, I want to suggest that there are two common Christian responses that both fall short. The first is the response of charity – of ‘giving to’. It can reduce suffering, it can sometimes save lives, yes. But it treats people as individuals – and it keeps their ‘problems’ individualised too. It doesn’t address the causes that keep people in poverty, that keep pushing people to the edges and off the edges (cf Dom Helder Camara). And so a second response is advocacy – ‘speaking for’. Public statements, protest, lobbying, organizing & marching in the streets… I took my 10-year-old down to London last Friday – his teachers were proud he took a day off school! It’s concerned with the causes, and not just the symptoms. It’s rooted in the prophetic tradition of the Hebrew bible. And yet, ‘too many advocates assume that they are somehow above or unaffected by the problem, merely seeking to help others who are less fortunate… the privileged supporting the underprivileged…’ (Rieger 2018). And within both charity and advocacy I think we have an imagination of a particular kind of flow going on: from God, through the church, into the world. The church receives something from God to give to those needy outside it. We’re sent to serve, to wash feet, to grow the kingdom. We’re fed in the eucharist to feed others. Or in more evangelical language, and found on wrist-bands for many years (although I think they’re fading in popularity now), ‘What Would Jesus Do?’ At one end of the axis, we imagine that we are the ones that are Christ to others. Or at the other end of the axis we might cite Matthew 25, and imagine Jesus in the hungry, the thirsty, the stranger, the naked – in the needy, facing us with open, empty hands. And all of that is good, but it can be seductive. I want us to think for a minute about the story of the temptations in the wilderness. Journey with me, with Jesus, into the desert. The temptations raise the question, “who are you?” Remember Jesus has just been baptised. He’s just heard the voice of God ringing in his ears, “you are my beloved Son, with you I am well pleased”. And now, he’s slung into the desert, and the tempter says to him, “if you are… if you are the Son of God…” And that identity crisis is one that afflicts the Church today as well, and the temptations are similar. The first is to what Bishop John V Taylor of the Church Mission Society [in his book The Christlike God] called “the power of the provider”. We hear language around us in Christian circles around the “golden opportunities” of the state withdrawing, of the invitation to the Church to “fill the gaps”. Providing for our neighbours is not a bad thing – but it construes our neighbour as lacking. And it can make us feel good, and useful and valuable, to provide for those who need – and that can be seductive. The “power of the performer” is one that certainly in my denomination, the Church of England, where all the graphs are going in the wrong direction and the numbers and the money seem to be leeching away – the power of the performer can be tempting. “We must do something! We must demonstrate our impact. People should see what we’re doing, and maybe they’ll change their minds about us!” It can be seductive, and it construes our neighbour as a spectator to our performance, as a consumer of our product. And lastly, the third temptation is to the “power of the possessor”. We hear talk of the importance of the church having “a place at the table”, of “the Christian voice being heard”, of remembering “the Christian heritage” of our society and “the Christian values” which underly things. And all of that is valid, maybe, but again, it’s the seduction of being in charge, of being in control of “our project”, “our activity”, “our justice movement”. And at its worst it construes our neighbour as being the one possessed, controlled. I am thankful to Donald Trump for just one thing. That he has highlighted, beyond reasonable doubt, that we live within white supremacist structures. In our society here in the UK as much within the United States. But… how might these words be if we also translate them into the language of gender? I’ve found it helpful again, in recent times, to come up against the definition of what I suspect will be used more and more in the next few years as a helpful lens: white fragility. Again, it comes from North America but I think it applies to us too. I think those of us in the room who are white may well recognise some of those descriptions, as something we don’t want to do, but something inside us does automatically. And I think again, we can probably translate quite easily into the language of gender, and the language of class. That defensiveness that those of us who are comfortable with privilege find welling up inside us when challenged. So what do we do with the habits and seductions of privilege, with our fragile but fiercely defended identities? I think we need to go back to the wasteland, back to the wilderness, and remember that at the end of the temptations story there were angels, and Jesus let them minister to him. So how do we do it? I think those of us in positions of multiple privilege need to learn to let go of our ‘centralness’, and move to the edges, perhaps literally, physically. We need to learn to resist those temptations – the power of the provider, the performer, the possessor. We need to learn to embrace real, intimate, mutual relationships, where we become open to challenge, learning and transformation. That means learning to listen. Otto Scharmer suggests that there are four levels of listening, and often we don’t get to the fourth. The first is, well, just listening to hear what we were expecting to hear. The second is to hear and maybe noticing something that’s interesting, and maybe different to what we’ve heard before, to what we were expecting. The third is listening to inhabit the shoes of the other. But the fourth level, what he calls generative listening, is a listening that enables something genuine new to emerge. A ‘hearing to speech’. Hearing to speech is never one-sided. Once a person is heard to speech, she becomes a hearing person. Jim Perkinson, another critical white theologian, suggests that those of us who are white need an ‘exorcism’, a ‘shaking of our being to the core’ which we can’t do on our own. We have to be open to a ‘grace from without’, we have to be ‘dis-located’, pushed to the edges so that we can learn from others. Like Jesus with the Syro-Phoenician woman. At the very edges of his travelling, in the region of Tyre and Sidon, a women challenges him and he says No and she will not give up. ‘Yes, but…’ she says. And for her ‘Yes, but’ Jesus is changed and turned around – a metanoia goes on. He heads back home, different. His mission expanded. In Hodge Hill Church a couple of years ago, Phil and a couple of members of Bromford Theatre Group came and performed on Remembrance Sunday. It was profoundly uncomfortable for some in the church because the performance reminded us of the class divides of war. It unsettled the cosy nationalism that glosses over those divisions. It refused a ‘glory story’, to look tragedy squarely in the face. And Phil in that Passion Play, playing the Roman centurion, asked us as the crowd, “Is this the Son of God? This man who turned over the tables in the temple, who turned the other cheek, who forgives his persecutors, is this the Son of God?” Phil asked us. It was a challenge to us, the Christians there, as much as to anyone else. Later on in Mark’s gospel, 7 chapters after the Syro-Phoenician woman, another unknown woman breaks into the gathering where Jesus is, interrupts the flow of proceedings and pours costly ointment all over Jesus’ head. And Jesus receives it as a gift. She, the prophetic stranger, makes him the Messiah, the ‘anointed one’. She, the prophetic stranger, sends him on his journey to the cross. In our eucharists, we may imagine we are being fed to feed others. We imagine that we are uniting spiritually and virtually [with those in need], in a crucible of passion, where we’re empowered to go out and speak for our neighbours. But what might a ‘deep solidarity’ that is eucharistically formed look like? In Hodge Hill, the Real Junk Food Kitchen gathers food every week that is intercepted from supermarkets and restaurants who otherwise would throw it away, and turns it into a 3-course meal that every week around 100 people in our neighbourhood come together to enjoy. It’s not a soup kitchen, it’s a shared meal. It’s ‘pay as you feel’, so if you have money you can stick some money in the tin. If you don’t have money or don’t want to put money in the tin you can give your time or your talents or your gifts. A couple of years after our first community Passion Play we did our first Street Nativity, and Soni (in the middle of the picture, wearing the King Herod costume) runs Atlantis Fish Bar. When we got to Atlantis Fish Bar with our three wise men following the star, Soni gave them a lecture about going to Bethlehem to find the child, and then coming back to report to him, and then he stripped off his robes and said, “free food for everybody!”. At that point, I get out my mobile phone and hastily tell the ladies at church, brewing the mulled wine, that we might be 45 minutes late! Soni’s generosity interrupted the church’s plans with an agenda that was straight from the Kingdom of heaven. Over recent years, our Muslim neighbours have invited us to share Iftar with them – breaking the fast during Ramadan – and have shown us so much about what prayer, fasting and hospitality look like. And in our neighbourhood most recently we have begun to reflect together on our journey of community-building over the years, of which the Passion Play was an early milestone. And in some of those reflective gatherings, the level of sharing and honesty that has happened, the level of excitement about what is happening in community, and wanting to tell others about it and invite others into it, has exceeded what most of the time I see in church. So I want to suggest finally, that we need to ‘flip’ the christological axis: from ‘What Would Jesus Do?’ to ‘What Would Zacchaeus Do?’, and from seeing Jesus only in our neighbour as hungry, thirsty, stranger to seeing Jesus in those who come with abundant gifts and abundant challenges to us. And maybe identifying, if we must, with a Jesus who is receptive to the abundant gifts and abundant challenges in the women who come to him and change him. A few weeks ago, we had our first community talent show. There was some real talent, and if you knew them, each who performed on stage also had real fragility – it took a lot to get them up there, to perform, not just on the night but in the years before of confidence-building, encouraging, nurturing, tending relationships and wounds and anxieties and stresses. And there was a quality about the audience: family members and close friends of each of the acts were there, but so were many others in the community. And it wasn’t really a competition – everyone cheered for everyone and encouraged them if they faltered and looked for the shining light even when the voices cracked or the nerves got shaky. Where ‘attending’ did not just mean showing up, but looking for something deeply hidden sometimes. Seeing the glory in the flesh – in the broken, imperfect, fragile flesh of those who were there, who put their bodies up on the stage. I want to introduce you to one last kind of edge. We’ve seen the cliff edge of precarity. We’ve seen the edges that people are pushed to through marginalization. I want to introduce you to the ecotone: it names that little stretch of earth between habitats, where immense fertility happens. The vital places where difference meet. We find them in our cities too, but we often don’t attend to them. Differences in race and class, of wealth and culture. Our cities are shot through with such edges, but they need tending and attending to. I wonder, could it ultimately be profoundly unhelpful, in these times of deep fragmentation, to locate Christ on one ‘side’ or the other of our divides? Perhaps we are invited neither to ‘perform Christ’ nor to identify Christ with the neighbours who challenge us most acutely – but to discover Christ as ‘taking place’ in the space of encounter between us and our neighbours. It is Christ who draws us to our neighbours, and it is Christ whom we discover – both creative and unsettling – in the encounters with them. Christ in the ‘ecotone’ – in the edges between us. And so perhaps we as the church should be concerned less with ‘expanding the territory’ of the body of Christ, and more with ‘extending the flesh of Jesus’ in those ‘contact-zones’, in those edges. Extending those places where we encounter each other across our differences, and discover that God is there. I want to finish with some more words of Gillian Ahlgren, resonant with much that Pope Francis has been saying in recent years.